There are many features and benefits of being registered as a model with Models Direct. We are looking for new animals and if you would like to apply for your pet to model with us... here's your opportunity! Models Direct provides online tools to set up and update your e-Portfolio simple and easy way. Photographers, advertising agencies, TV, film companies and business executives are the decision makers hiring models, and they want to see a wide selection of models quickly. Based on this information, models are selected to appear on the catwalk, screen, cataloge, film set, stage and event … to be the star. Being seen on 'The World Stage' with your Models Direct e-Portfolio means you will be available to hirers and managers across the Globe. Let them see you - today! Update photos, video file, audio clip, CV/resume, statistics, details, statistics and experience. You can update your e-Portfolio as your look changes and you get more experience – Hirers choosing models need to know about changes and see the difference. Remember you can access and change your e-Portfolio online from anywhere - work, home, on holiday, college... all you need is web access. Models Direct will automatically tell you by email every time you have been put forward for a modelling job plus every time your e-Portfolio has been looked at by a Hirer. No more wondering what's going on – now you are the first to hear! No other agency offers this benefit. Selected: Whenever you are selected by a Hirer for a booking, Models Direct will automatically notify you by email with all the details (including job dates, requirements, fees etc.). We will also call you and discuss every aspect of the booking with you. Not selected: If you are not selected for a booking, Hirers have the opportunity to say why - this may help and encourage you to review and improve your e-Portfolio. This is a highly effective, online visual display - a real hands-on approach to success! Print or email your e-Portfolio and forward it to prospective employers, colleagues and friends – let them see you mean business. Never miss out on a good opportunity. Not just anyone can look at models on the site. Hiring companies and all others MUST first register before using the system. Models Direct have approval procedures to ensure the validity of Hirers. All Hirers must first meet these requirements BEFORE a booking is made, or a hirer requests to search the database. Online daily news and industry updates, castings and newsflashes. Where the action is, what the castings are for, who is looking, who is making the bookings. An index of headings in film, fashion, music, advertising, video and entertainment, listing anyone and everyone who can help you be a star. Who they are, what they do and where you can reach them! When a job is complete you will receive an automatic email asking for feedback. 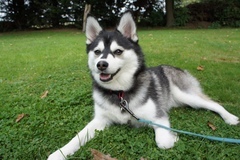 "The assignment involved taking my pet pomsky Kali to Lapland UK for the day. Our role was to meet and great all the visitors, interact with the children and allow them to touch and pet Kali and have photos. I found the day thoroughly enjoyable and was so pleased with how Kali behaved, she was brilliant with all the children and her lovely soft nature was ideal! Everyone seemed to really love how small Kali is and how rare it is to see such a small 'husky'. I think being part of an agency such as Models Direct is a fantastic idea. They take all the hard work out of finding assignments and also give you the opportunity to get involved in things you otherwise might not have the opportunity to do."